With unsurpassed odor control and tight clumping ability, this clumping cat litter is ideal for homes with one or two cats. World's Best Cat Litter™ is the only litter made from whole-kernel corn. That means it has the naturally microporous structure that traps nasty ammonia odor in every clump - all without any artificial perfumes or scents. By using World's Best Cat Litter™ to eliminate the odor, you'll help keep your entire house smelling fresher. Visitors won't notice that lingering "litter box smell." Some cats refuse to use heavily perfumed or excessively smelly boxes. But your cat will appreciate the odor control of World's Best Cat Litter™. Most importantly, litter odor doesn't have to come between you and your cats! 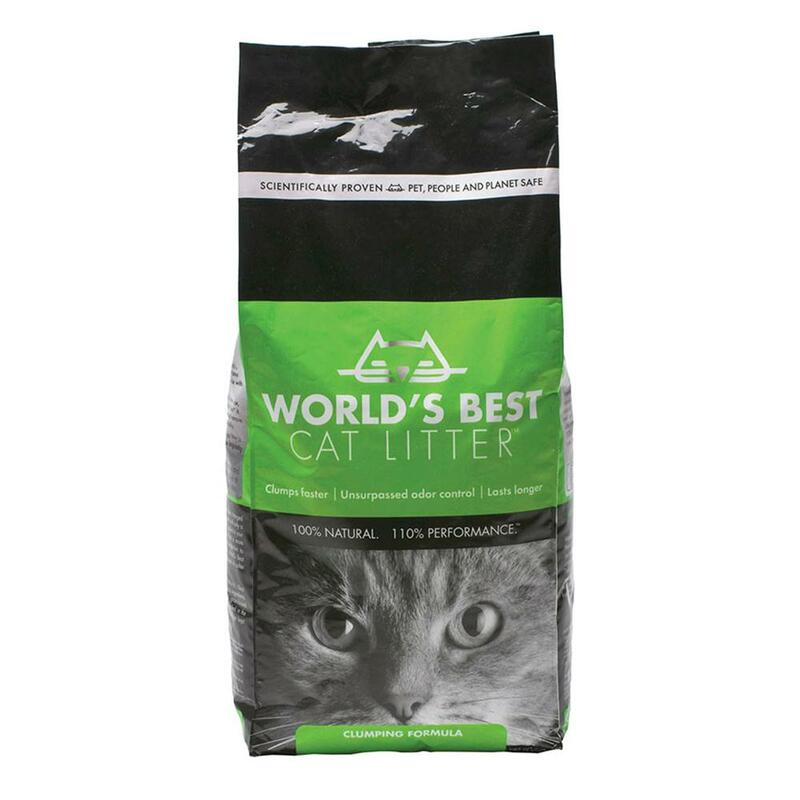 World's Best Cat Litter™ clumps moisture on contact - with no seeping, sinking to the bottom or sticking to the sides of the box like other so-called clumping litters. And each compact clump locks in odor. s Best Cat Litter™ last longer, too! We've done laboratory and scientific cat litter comparisons to prove that, with its patented clumping formulas, World's Best Cat Litter™ makes hard, compact clumps that are easier to clean up. World's Best Cat Litter™ absorbs moisture on contact for convenient scooping. No more chiseling or scraping. Clean the box with less effort. Clumps made with World's Best Cat Litter™ hold strong so a single scoop does the trick. Let's face it; scooping cat litter is also easier when you can't smell it! World's Best Cat Litter™ traps odor in each clump! Go on, flush it! * Because World's Best Cat Litter™ disperses in water, you won't have to wait for 20 minutes before you flush as other litters suggest. Clumping on contact keeps the rest of the litter dry. As a result, one bag of World's Best Cat Litter™ can last up to 2 or 3 times longer than other clumping litters. And not only will that save you time, but it will also save you money. Naturally absorbent whole-kernel corn enables World's Best Cat Litter™ to clump faster than other clumping litters - so you use less litter in the long run. small bag can last one cat for over four weeks! Because World's Best Cat Litter™ is made from all-natural ingredients - with no added chemicals - it's totally safe for cats and the whole family. There are no toxins in case it is ingested. And when you compare cat litters, you'll find there's no silica dust for you or your cat to breathe. World's Best Cat Litter™ is recommended by veterinarians! World's Best Cat Litter™ is pet-, people- and planet- friendly! Unlike other so-called flushable litters, which recommend you wait 20 minutes or more before you flush, World's Best Cat Litter™ can be flushed right away. Because it's flushable, World's Best Cat Litter™ helps save landfill space. *The State of California encourages the disposal of cat feces in trash and discourages flushing cat feces in toilets or disposing of them in drains.